Differential diagnosis of transplant glomerulopathy, a common lesion observed after kidney transplant that is associated with poor prognosis, remains challenging because its morphologic pattern (double contour of the glomerular basement membrane) is found in several disease processes. The authors used archetype analysis, a probabilistic data-driven unsupervised statistical approach, to identify distinct groups of patients (archetypes) with this condition. By applying this approach to a large, comprehensively phenotyped multicenter cohort from patients diagnosed with transplant glomerulopathy on the basis of post-transplant biopsies, the authors identified five archetypes with distinct clinical, histologic, and immunologic features, as well as different outcomes (kidney allograft survival rates). The findings suggest that an archetype-based characterization of this condition may improve risk stratification for individual patients undergoing kidney transplant and those included in clinical trials. Background Transplant glomerulopathy, a common glomerular lesion observed after kidney transplant that is associated with poor prognosis, is not a specific entity but rather the end stage of overlapping disease pathways. Its heterogeneity has not been precisely characterized to date. Methods Our study included consecutive kidney transplant recipients from three centers in France and one in Canada who presented with a diagnosis of transplant glomerulopathy (Banff cg score ≥1 by light microscopy), on the basis of biopsies performed from January of 2004 through December of 2014. We used an unsupervised archetype analysis of comprehensive pathology findings and clinical, immunologic, and outcome data to identify distinct groups of patients. Results Among the 8207 post-transplant allograft biopsies performed during the inclusion period, we identified 552 biopsy samples (from 385 patients) with transplant glomerulopathy (incidence of 6.7%). The median time from transplant to transplant glomerulopathy diagnosis was 33.18 months. Kidney allograft survival rates at 3, 5, 7, and 10 years after diagnosis were 69.4%, 57.1%, 43.3%, and 25.5%, respectively. An unsupervised learning method integrating clinical, functional, immunologic, and histologic parameters revealed five transplant glomerulopathy archetypes characterized by distinct functional, immunologic, and histologic features and associated causes and distinct allograft survival profiles. These archetypes showed significant differences in allograft outcomes, with allograft survival rates 5 years after diagnosis ranging from 88% to 22%. Based on those results, we built an online application, which can be used in clinical practice on the basis of real patients. 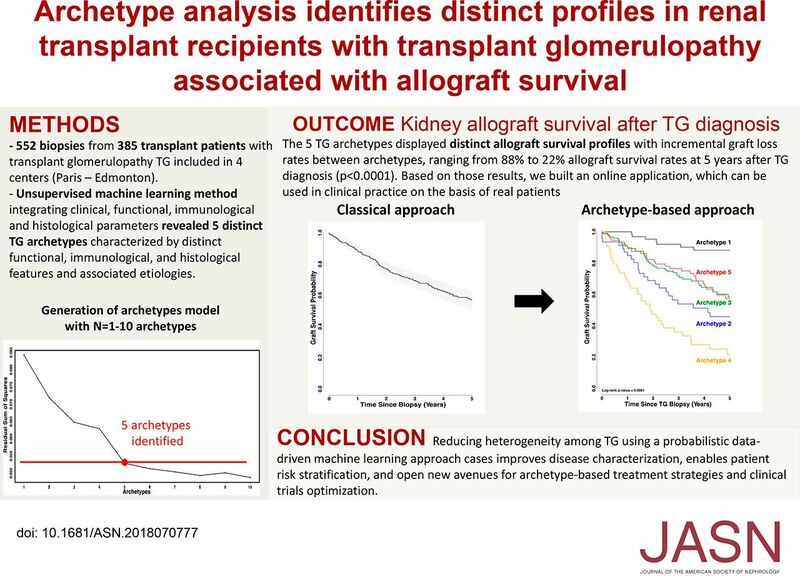 Conclusions A probabilistic data-driven archetype analysis approach applied in a large, well defined multicenter cohort refines the diagnostic and prognostic features associated with cases of transplant glomerulopathy. Reducing heterogeneity among such cases can improve disease characterization, enable patient-specific risk stratification, and open new avenues for archetype-based treatment strategies and clinical trials optimization.